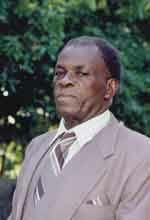 One of St. Vincent and the Grenadines’ political stalwarts has died. Charles, son of Emelia and Urias Charles, was known for his involvement in the 1930âs struggles for the people’s rights, freedom and democracy. He was leader of the Eight Army of Liberation and member of the St. Vincent Workingmen’s Association. He struggled for Adult Suffrage with the late “comrade” Ebernezer Theodore Joshua, who later split from Charles’ Eight Army to form the People Political Party and became the country’s first Chief Minister. Charles’ son, George Charles Jr., in a solemn interview with Searchlight at his Arnos Vale home Wednesday afternoon, described his father as “a people’s man”. “He was real gentle. He was always loving toward people. He was for the people. He normally liked to feel that he was recognized for the person he was, just him … He was a man of and for the people… He would always give anybody anything but he would never take rubbish from anyone,” he stated emotionally. Charles Jr. also said his father was forthright and strong. Charles Jr. said his father shared some of his political experiences with him from time to time, joking about the past and some of his older colleagues. Asked if his father kept abreast of politics, Charles Jr. replied in the affirmative, saying that his father often applauded when he listened to the National Budget debates â even though he was 87 years of age. He also said that his father usually questioned why his name was not mentioned at certain national or political functions. Charles Jr. feels that his father was left to fade into oblivion as not enough was done to make him known to the younger generation. âSuch ignorance led to abuse,â he said. “Young people have been very abusive to him, because they did not know him. He said to me about three weeks ago, ‘I am the first man in this country that gave all these school children books out of my own pocketâ.â He further said that his father always felt he had been abused by some people he trusted. Charles Jr., who lives in England, said after he realized his father needed care, he decided to return home. “I didn’t want them to have my father in a nursing home and leave him to rot…. I am not going to go back to London, not because of the atrocities they handed to him. I am bitter because of the way he had been treated. Sometimes you don’t want to be political because when you are political they say you are one-sided,” he stated. Charles Jr. further said his father was even abused and neglected at the hospital because he was not recognized. George Jr. said his father showed no sign of dying, but he knew his father was going to die. George Hamilton Charles will be accorded a State funeral next week.